File Name: Clayton M. Abernathy of Denver, Colorado. Notes: Denver is in the north central part of the state, with Buckley Air Force Base in the vicinity. Denver is also the hometown of Mace. Notes: Sunbow's Hawk had black hair and wore his 1986 outfit, with brown boots and opaque white-lensed goggles on his helmet. Early ads for Marvel comics featured the 1982 outfit with brown straps and belt, and with a cap rather than a helmet. In the DiC series, Hawk had brown hair and wore his 1991 flight outfit in season 1 and his Battle Commanders outfit in season 2, although his flight pack also appeared in the second-season episodes The Sword and A Is for Android. The season 2 outfit's pants usually had brown triangles but sometimes had orange camo spots or were plain tan. The color of his hat also varied. He wore his Version 11 outfit in Valor vs. Venom, in which he spent much of the movie transformed into Venomous Maximus. Accessories: dark olive helmet (82 Short-Fuze's), clear visor (82 Short-Fuze's). Hawk comes from a well established (real loaded) family. He's a West Point graduate, top of class and has seen action in a number of trouble spots. Graduated: Advanced Infantry Training; Covert Ops School. Served on Cadre, North Atlantic Range Command, and USA ENG COM EVR Missile and Radar Training; (classified). Qualified Expert: M-16, M-1911A1 auto-pistol. "He is keenly intelligent and perceptive and quite capable of totally selfless acts in support of his team-mates. An excellent leader!" Variations: Re-tooled in 1983 to accommodate swivel-arm battle grip and a new waistpiece design. Yojoe.com lists swivel-arm Hawk as version 1.5. The prototype in the 1982 catalog had gold straps and shoulder pockets, and a solid black visor. Reissues: The M.M.S. was reissued in spring 1983 with swivel-arm Hawk. Carded Accessories: black pistol (85 Keel-Haul's), light green helmet with large brim and engraved goggles (new), wide olive backpack with engraved canteen (new). Mail-order Accessories: gold submachine gun (91 Cobra Commander's). Hawk was the original field commander of the Joe Team before he got his General's star and was booted upstairs to honcho the entire G.I. Joe Operation. He's a West Point graduate and has a list of special education credits as long as his arm, but he still managed to get the main body of his experience out there where it counts - on the battle field. "Hawk's the type of commander who goes out and gets shot at like everyone else. Troops respect that. They know he won't ask them to do anything he isn't willing to do himself. And that's why they are willing to do anything Hawk tells them." 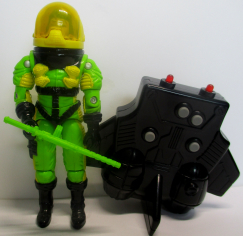 Variations: Hawk's helmet has black goggles in the 1986 catalog and commercials but was produced with green goggles. 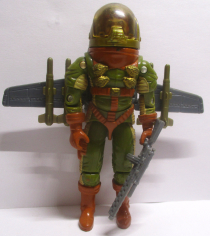 Mail-order Hawks came with a gold '91 Cobra Commander' submachine gun instead of the pistol, and no helmet or backpack. Toy Notes: Item #6468. Featured in the Devilfish commercial. Reissues: Reissued in the fall 1992 mail offer Terror on the Tundra. Accessories: grey double-barreled machine gun with thin stock (new), four small gold missiles with fins at back and slots for flight pack (new), gold round flight helmet with breather on front (new), clear round face shield (new), grey flight backpack with folding wings and tabs for missiles (new). As a rule, General Officers direct battle from the safety of the rear echelons, but the commander of a tightly coordinated, rapid deployment force like the G.I. Joe Team has to be right on top of the action at all times, ready to make split-second decisions on tactical developments as they happen. The combination of jet pack and communications helmet allows HAWK to survey the progress of battle as well as keep in constant radio contact with all elements of his command! "Some Generals like to come out and give a nice rousing speech before a fight, full of 'go-get-'em' and 'yay team,' and that's the last you see of them until the dust settles and they're back up from the rear again, handing out medals and trying to look as battle-weary as they can in starched fatigues. When Hawk takes you into a hairy situation, he's usually in FRONT of you yelling, 'Follow me!'" Accessories: large gold .45-cal. revolver with scope (new), gold rifle with forward grip and large scope (new), gold talking sonic backpack (new), gold bent antenna for backpack (new), black figure stand (common). One thing the G.I. Joes know for certain, when they hear HAWK give the command to "MOVE OUT!" he'll be giving it from in front of them and not from the rear! As commanding officer of the G.I. Joe Team with the rank of a 2-star General, Hawk could command his unit from an armored bunker or a high-flying aircraft, but that's not his style. He's a West Point graduate who's smart enough to know that 10 minutes with his soldiers on a real battlefield is worth more than a year in the classroom, and such an act will do more for their morale than a regiment of donut dollies ever could - well, almost. Hawk enjoys directing the combat action from the G.I. Joe Patriot or from G.I. Joe's Fort America! Toy Notes: Item #6751. To remove the backpack, unscrew the pack's outer screws. The screws attaching the pack to the figure are inside, along with the batteries. Accessories: pink or black rifle (91 Flint's), gold helmet with clear face shield (93 Duke's). In space warfare, there's no such thing as a designated battle perimeter - the whole universe is on the front-line field of fire! Even when replenishing your oxygen supply or recharging a laser pistol, you MUST stay on alert, and no one does that better than GENERAL HAWK. He watches his own back as well as those of his men. "He's just one of those guys you tend to feel safe with," says Rock 'n Roll. "Even those dumb ol' Cobra B.A.A.T. 's aren't lame enough to try a sneak attack with Hawk around!" Hawk has seen plenty of interstellar combat, and was even present during the brutal battle to liberate the moon from Cobra. According to Hawk, "That lunar nightmare was one of [the] toughest fights ever, if I'd only had the Armor Bot then, I could have vaporized B.A.A.T.s by the hundreds!" Motto: "If you can't stand the heat, stay away from the sun!" Variations: Some copies came with a rifle that was black rather than pink. Accessories: green machine gun (91 Hawk's), yellow helmet (91 Hawk's), clear yellow face shield (91 Hawk's), black backpack (91 Maj. Bludd's), black figure stand (common). Toy Notes: First available in the Fangs of Doom mail offer. Reissues: Reissued in the fall 1993 mail offer Menace in the Wilderness. Accessories: plain green helmet (82 Short-Fuze's, undersized), black backpack (86 Hawk's), black figure stand (common). In his childhood, Hawk always looked to the sky. He was fascinated by the man-made objects streaking over his head with such speed and power. He joined the military and graduated from Officers Candidate School at West Point. Served on cadre with the North Atlantic Command and USA ENG COM EVR missile and Radar training station. He held the position of Missile Commander until he received his General's star and was offered command over G.I. Joe operations. His list of credits are as long as his arm, most of his experience comes from where it counts - on the battlefield. General HAWK is the type of commander who goes out and gets shot at like everyone else. Troops respect that. They know he won't ask them to do anything he isn't willing to do himself. When the government closed down the G.I. Joe program, he was forced to work behind a desk. Using this as a forum, all his efforts went to prove terrorist organizations, such as COBRA, were still a threat and required a special unit to combat them. It didn't take long for the results to be shown, as enemy forces were once again on the rise. The call to arms and return of the G.I. Joe Team was all General Hawk needed. You can find him standing on top of the MAULER Battle Tank as it rolls into battle. FILE EXCERPT from the JOINT-CHIEFS-OF-STAFF: "General Hawk is keenly intelligent and perceptive, quite capable of selfless acts in support of his team. An excellent leader!" Motto: "May the wings of freedom, never lose a feather." Toy Notes: Boxed with the Toys 'R Us exclusive A-10 Thunderbolt, which also included Ace. Item #28019. 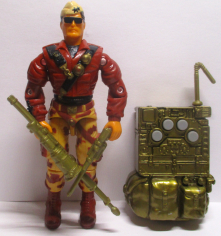 It is unknown whether Hasbro-Kenner intended to release a new version of the Mauler mentioned on Hawk's filecard, but the similar M.O.B.A.T. would be released the following year. Accessories: silver revolver (92 Gen. Hawk's), silver rifle (86 Dial-Tone's), silver rifle (92 Gen. Hawk's), black figure stand (common). He's the same superb, spirited leader with a different name and a new mission. A recent unprecedented collapse in G.I. Joe's top secret, personnel data system forced the issuance of new code names to several top G.I. Joe brass. Hawk was one of them. Known for his distinguished and exemplary military service and leadership qualities, Gen. Tomahawk now commands a highly trained, undercover special ops unit whose mission is to penetrate COBRA's sophisticated defense network and sabotage their efforts to control the world wide web. Clicking and dragging may be new battlefield strategies, but Gen. Tomahawk is up for the challenge. Anything to make that serpent's evil existence as miserable as possible. Gen. Tomahawk's career spans over three decades. Guts and glory are synonymous with his name, no matter what he's called. His unique brand of leadership mixes battlefield instincts with a dash of cunning that keeps COBRA dazed and defeated, even beyond the peripheral bounds of cyberspace. Toy Notes: Carded in a two-pack with Dial Tone. Item #57730. Accessories: silver revolver (92 Gen. Hawk's), black submachine gun and stock (91 Dusty's), black backpack (91 Dusty's), black figure stand (common). When GENERAL TOMAHAWK orders his men into battle, he stands in front of them to lead the way. He believes that a general should be among his men, showing them how to fight and how to win. Under his command, soldiers learn to be courageous defenders of peace. A West Point graduate and two-star general, he has seen plenty of action in conflicts around the world. The United States Army relies on men like GENERAL TOMAHAWK to carry on the proud, tough tradition of America's fighting forces. He has been after the elusive HEADMAN for some time. He wants to stop the smuggler and thief from his corrupt undertakings, which have threatened the peace of many nations. "The commander of any team must be an example to his troops in courage, dedication, and skill." Toy Notes: Carded in a two-pack with Headman. Item #57470. Accessories: black pistol (03 Beachhead's), black rifle (04 Cobra Trooper's), two black grenades (91 Big Ben's). When GENERAL ABERNATHY, also known as Hawk, orders his men into battle, he stands in front of them to lead the way. He believes that a general should be among his men, showing them how to fight and how to win. Under his command, soldiers learn to be courageous defenders of peace. A West Point graduate and two-star general, he has seen plenty of action in conflicts around the world. The United States Army relies on men like GENERAL ABERNATHY to carry on the proud, tough tradition of America's fighting forces. He has been after the COBRA forces, and COBRA COMMANDER in particular, for some time. He wants to stop this dangerous organization and the criminal running it, once and for all. Toy Notes: Carded in a three-pack with Sgt. Stalker, Double Clutch, and a reprint of Marvel #3. Item #30361. Accessories: grey pistol (03 Black Out's), grey submachine gun (92 Shockwave's), two grey grenades (91 Big Ben's), black communications gauntlet (04 Duke's). When GENERAL ABERNATHY orders his men into battle, he stands in front of them to lead the way. He believes that a general should be among his men, showing them how to fight and how to win. Under his command, soldiers learn to be courageous defenders of peace. Comrades and enemies alike call him by his nickname "Hawk." A West Point graduate and two-star general, he has seen plenty of action in conflicts around the world. The United Stats Army relies on men like GENERAL ABERNATHY to carry on the proud, tough tradition of America's fighting forces. Kidnapped by DESTRO, he becomes one of the DNA-venom test subjects of DR. MINDBENDER and is changed into VENOMOUS MAXIMUS, a ferocious, hybridized monster controlled by COBRA COMMANDER. Only with the help of the G.I. JOE Team can he hope to escape this fate. "I am proud to lead the finest fighting force in the world. Together, we will defeat the COBRA organization and put an end to its evil plans." Toy Notes: Carded in a two-pack with Over Kill. Item #55990. Accessories: black pistol (03 Black Out's), black rifle (04 Cobra Trooper's), black knife (91 Low-Light's), green battle helmet with large grey goggles on brim (new). When GENERAL ABERNATHY orders his men into battle, he stands in front of them to lead the way. He believes that a general should be among his men, showing them how to fight and how to win. Under his command, soldiers learn to be courageous defenders of peace. Comrades and enemies alike call him by his nickname "Hawk." A West Point graduate and two-star general, he has seen plenty of action in conflicts around the world. His troops know he won't ask them to do anything he isn't willing to do himself. That's why they are willing to do anything he tells them. Toy Notes: Carded in a three-pack with Tunnel Rat, Flint, and a reprint of Marvel #74. Item #61207. Accessories: black pistol (07 Snake Eyes's), black rifle (83 Snow Job's), black knife with silver blade (07 Snake Eyes's), olive helmet (08 Sgt. Flash's), clear visor (82 Short-Fuze's), black webgear with dark green grenade (07 Snake Eyes's), black Joe figure stand. When G.I. JOE HAWK orders his men into battle, he stands in front of them to lead the way. He believes that a general should be among his men, showing them how to fight and how to win. Under his command, soldiers learn to be courageous defenders of peace. Comrades and enemies alike call him by his nickname "Hawk." A West Point graduate and two-star general, he has seen plenty of action in conflicts around the world. It was "Hawk" who led the G.I. JOE team on their first assault of COBRA Island. His troops know he won't ask them to do anything he isn't willing to do himself. That's why they are willing to do anything he tells them. Toy Notes: Carded in a two-pack with Scarlett and a reprint of Marvel #1. Item #28423. Accessories: black pistol (07 Snake Eyes's), black rifle (83 Snow Job's), black knife with silver blade (07 Snake Eyes's), dark green helmet with silver eagle on front (08 Sgt. 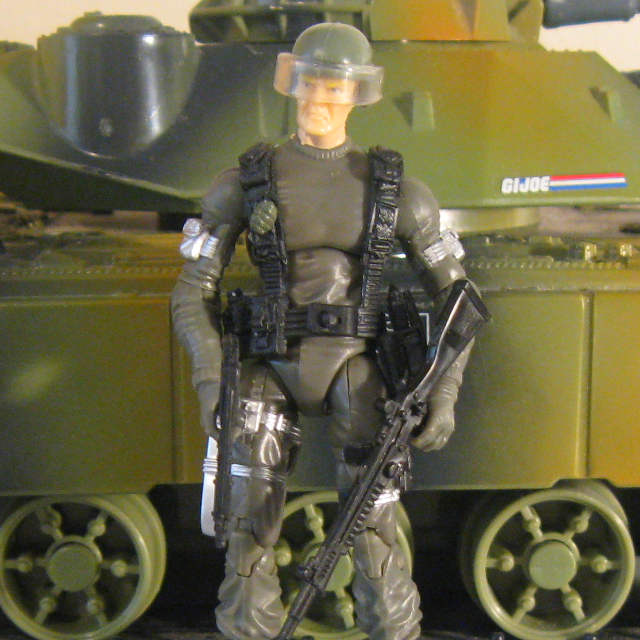 Flash's), clear visor (82 Short-Fuze's), black bandolier with green pocket and silver grenade (07 Duke's), black Joe figure stand. G.I. JOE HAWK was the original field commander of the G.I. JOE team before he got his General's star and was booted upstairs to honcho the entire G.I. Joe operation. He's a West Point graduate and has a list of special education credits as long as his arm, but he still managed to get the main body of his experience out there where it counts - on the battle field. "G.I. JOE HAWK is the type of commander who goes out and gets shot at like everyone else. Troops respect that. They know he won't ask them to do anything he isn't willing to do himself. And that's why they are willing to do anything he tells them." Toy Notes: Boxed in a Toys 'R Us-exclusive three-pack with Duke, and Grunt. Item #32149, set 1 of 3. Accessories: black pistol (06 Med Alert's), green helmet with black goggles on brim (new), wide green backpack with engraved canteen (new), black Joe figure stand. Accessories: black pistol (06 Med Alert's), light green helmet with black goggles (08 G.I. Joe Hawk's), light green backpack (08 G.I. Joe Hawk's), black Joe figure stand. G.I. JOE HAWK was the original field commander of the G.I. JOE team before he got his General's star and was booted upstairs to honcho the entire G.I. JOE operation. He's a West Point graduate and has a list of special education credits as long as his arm, but he still managed to get the main body of his experience out there where it counts - on the battle field. G.I. JOE HAWK is the type of commander who goes out and gets shot at like everyone else. Troops respect that. They know he won't ask them to do anything he isn't willing to do himself. And that's why they are willing to do anything he tells them. "A commander must be an example of courage and dedication to his team. He must also be wiling to take the heat for his troops -- not just the glory." Toy Notes: Boxed with Snake Eyes, Lady Jaye, Flint, and Shipwreck. Item #36449.